Ahhh November. I've realized that one of my favorite things about this time of year, other than pumpkin pie, is those elusive cold-but-sunny days. Days when you can wear an enormous wool sweater and a fuzzy vest and be good to go. Which brings me to this sweater - it's good, right? I didn't even know I liked turtlenecks that much, but it turns out I really do. Like, I could live in this thing. Through Eat, Sleep, Denim it's on loan to me from the good folks at MiH, and I'm kind of obsessed. MiH jeans sweater; BDG denim leggings; Nordstrom Faux fur vest (old, similar); vintage Ray-Ban sunglasses (similar); Jessica Simpson ballet flats; NARS Heat Wave. Same vest, different day, am I right? I feel like faux fur vests are definitely not trendy this season, and maybe that's why I'm getting such a kick out of bringing mine back this fall and winter. It's gigantic, not particularly figure-flattering and so, so warm. I can't get enough. So where did I get this whole "Audrey at the ski chalet" thing? 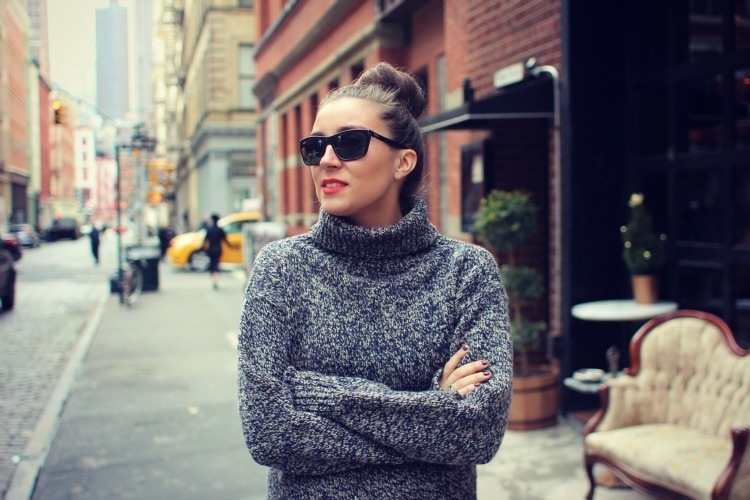 I think it's the combination of top knot, black shades, skinny black pants and ballet flats - with the simple-but-cozy sweater. The lipstick definitely doesn't hut the glamour factor, either. I like to think that if Breakfast at Tiffany's were filmed in Sun Valley, Holly would wear something like this. Do you think? And that should be a :) not a frown!!! In lovee with this sweater. I don't blame you for wanting to wear it all the time. I really like how you did the turtleneck with the fur vest. I have a similar sweater that I spent way too much money on and NEVER wear. Might have to try out a similar look and see if I can warm up to the look (sorry for the lame pun). you look amazing! can all of this look just appear in our closet? comfy, cozy, and chic . . . sign us up!!! I found your blog through IFB (addicted to that site!) and am so absolutely stoked that I did! I'm a fashion blogger from New Zealand about to relocate to New York soon, and it's cool to know that another blogger has experienced the whole 'moving' thing! I spent a lot of time in Seattle previously, so it's a new corner of the States to explore! Anyway, just wanted to say that I love this look and will absolutely try it once I touch down in New York soon! You look amazing! This sweater is beautiful. Also, you've now inspired me to put on red lip stick! Fabulous, lady!